Delightful beach activities await! In this sheltered, deeply indented cove, the silky, sandy bottom shelves out very gradually for many yards, as gentle waves lap onto the beach. 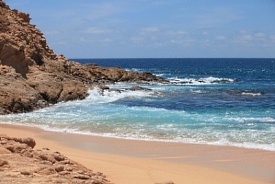 Located in the Sea of Cortez, the island offers both beachscapes and sweeping deserts. Isla Partida and its close neighbor, Isla Espíritu Santo, are both protected by UNESCO as biospheres.